Data Binding support in Syncfusion SfDataGrid. SfDataGrid control is designed to display the bounded data in a tabular format. The data binding can be achieved by assigning the data sources to SfDataGrid.ItemsSource property. If the data source implements INotifyCollectionChanged interface, then SfDataGrid control will automatically refresh the UI when item is added, removed or while list cleared. When you add, remove item in ObservableCollection, SfDataGrid automatically refresh the UI as ObservableCollection implements INotifyCollectionChanged. But when you do the same in List, SfDataGrid will not refresh the UI automatically. SfDataGrid control supports to bind any collection that implements the IEnumerable interface. All the data operations such as sorting, grouping, filtering, summaries are supported when you are binding collection derived from IEnumerable. SfDataGrid control supports to bind the DataTable. SfDataGrid control automatically refresh the UI when you are binding DataTable as ItemsSource when rows are added, removed or cleared. Below are the limitations when binding DataTable as ItemsSource to SfDataGrid. GridUnboundColumn.Expression is not supported. You can achieve the expression support when binding DataTable using DataColumn of DataTable by setting DataColumn.Expression property. AddNewRow is not support when filtering is enabled. Advanced Filtering does not support Case Sensitive filtering. Custom sorting is not supported. Filtering with TimeSpan values is not supported. SfDataGrid doesn’t support LiveDataUpdateMode - AllowDataShaping and AllowSummaryUpdate. 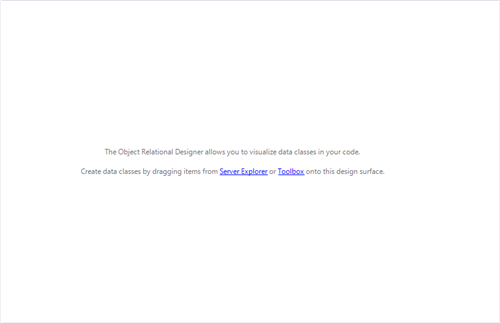 In WinRT, UI won’t get refreshed when you are changing the property value. This is limitation in WinRT platform. All the data operations (sorting, grouping, filtering and etc.) are supported when you are binding dynamic data object. If the data operations are not working as expected, set SfDataGrid.IsDynamicItemsSource property as true . SfDataGrid control provides support to bind complex property to its columns. To bind the complex property to GridColumn, set the complex property path to MappingName. All the data operations (sorting, grouping, filtering and etc.) are supported when you are binding complex property. If the data operations are not working as expected, set GridColumn.UseBindingValue as true to make it work. SfDataGrid control provides support to bind an indexer property to its columns. To bind an indexer property to GridColumn, set the indexer property path to MappingName. All the data operations (sorting, grouping, filtering and etc.) are supported when you are binding indexer property. If the data operations are not working as expected, set GridColumn.UseBindingValue as true to make it work. Based on type of data item bound to SfDataGrid, the data operations and column auto generation are carried out. You can specify the type of underlying data item explicitly for doing data operation by setting SfDataGrid.SourceType property. For example, when you set SourceType property, the columns are generated based on members of SourceType regardless of data items actual type. When your ItemsSource have different types derived from same type, you can set SourceType as base type for all different types. SfDataGrid.ItemsSourceChanged event occurs when the data source is changed by using ItemsSource property. This event receives two arguments namely sender that handles SfDataGrid and GridItemsSourceChangedEventArgs as objects. DataGrid has the View property of type ICollectionViewAdv interface that implements ICollectionView interface. View is responsible for maintain and manipulation data and other advanced operations like Sorting, Grouping, Filtering and etc. When you bind Collection to ItemsSource property of SfDataGrid, then View will be created and maintains the operations on Data such as Grouping, Filtering, Sorting, Insert, Delete, and Modification. Following are some important properties that can be used for various purposes. DataGrid creates different types of views derived from ICollectionViewAdv interface based on ItemsSource. Records IRecordsList Maintains the Records that are displayed in View when DataGrid is not Grouped. TopLevelGroup TopLevelGroup Maintains the Group information when DataGrid is Grouped. TopLevelGroup.DisplayElements GroupDisplayElements Maintains the Records and Group information that are displayed in View when DataGrid is Grouped. Filter Predicate<object> Get or sets the method that determines the data is suitable to be displayed in View. FilterPredicates ObservableCollection<IFilterDefinition> Maintains the FilterPredicates that are created while filtering using Filtering UI. Groups ReadOnlyObservableCollection<object> Maintains the top-level group information. It returns null value when there are no groups. GroupDescriptions ObservableCollection<GroupDescription> Maintains the GroupDescription collection information. It describes how the items in the collection are grouped in the view. SortDescriptions SortDescriptionCollection Maintains the SortDescription collection information. It describes how the items in the collection are sort in the view. SourceCollection IEnumerable Maintains the underlying source collection. The following events are associated with View. RecordPropertyChanged event is raised when the DataModel property value is changed, if the DataModel implements the INotifyPropertyChanged interface. The event receives with two arguments namely sender that handles the DataModel and PropertyChangedEventArgs as object. PropertyName – It denotes the PropertyName of the changed value. CollectionChanged event is raised whenever that is some change in Records / DisplayElements collection. The event receives two arguments namely sender that handles View object and NotifyCollectionChangedEventArgs as object. Action - It contains the current action. (i.e.) Add, Remove, Move, Replace, Reset. NewItems - It contains the list of new items involved in the change. OldItems - It contains the list of old items affected by the Action. NewStartingIndex - It contains the index at which the change occurred. OldStartingIndex-It contains the index at which the Action occurred. SourceCollectionChanged event is raised when you make changes in SourceCollection for example add or remove the collection. The event receives two arguments namely sender that handles GridQueryableCollectionViewWrapper object and NotifyCollectionChangedEventArgs as object. OldStartingIndex - It contains the index at which the Action occurred. The following is the methods that are associated with View which can be used to defer refresh the view. DeferRefresh Enter the defer cycle so that you can perform all data operations in view and update once. BeginInit & EndInit When BeginInit method is called it suspends all the updates until EndInit method is called. You can perform all the updation with in these methods and update the view at once. View has properties that already defined in SfDataGrid. It recommended setting those properties via SfDataGrid. In this walkthrough, you will learn about how to create a WCF service and load it to SfDataGrid control. You can skip the below steps and directly add service reference to the client application, if you are having already running service. 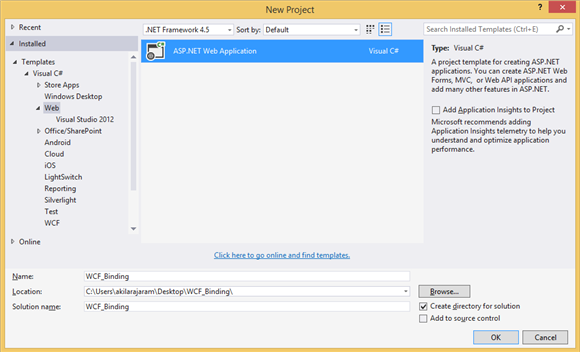 In NewProject dialog box, select the Web template under Visual C# and then select ASP.NET Web Application. Name the project file as WCF_Binding and then click OK to create project. Right-click on your web project, select Add option and then click New Item. 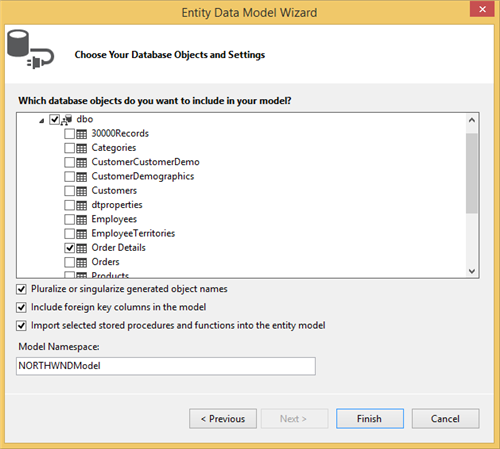 In the Add New Item wizard, select ADO.NET Entity Data Model under Data Template. Name the data model as “Northwind” and click Add button. 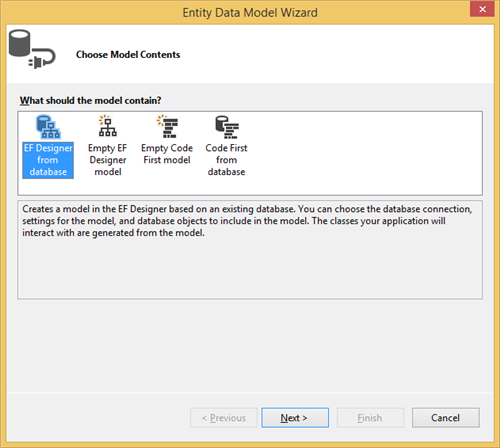 In the Entity Data Model Wizard, select EF Designer from Database, and then click Next. Choose Your Data Connection page appears and select Northwind database available in the drop-down list (OR) select the New Connection button to configure a new data connection. 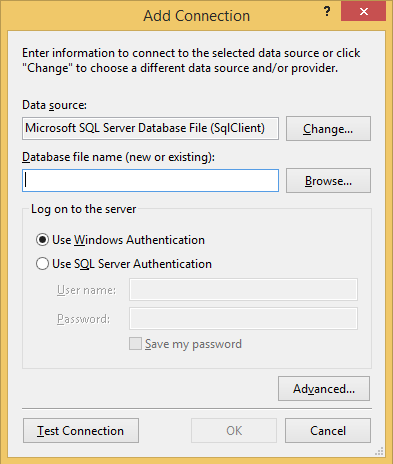 For more information, you can refer: How to: Create Connections to SQL Server Databases. Click Next button and the Choose Your Database Objects and settings page appears. Expand Tables node and select Order_Details table. 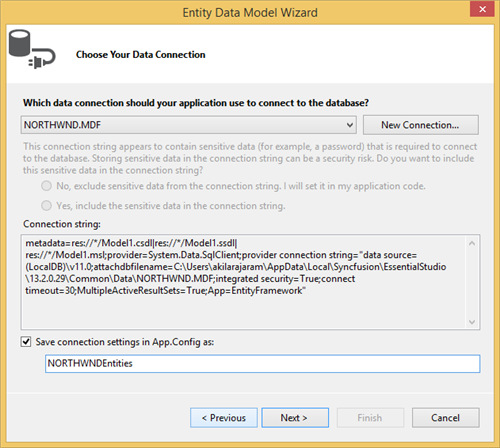 Now select Finish button to add the entity model for “Northwind.edmx” file to your web project. 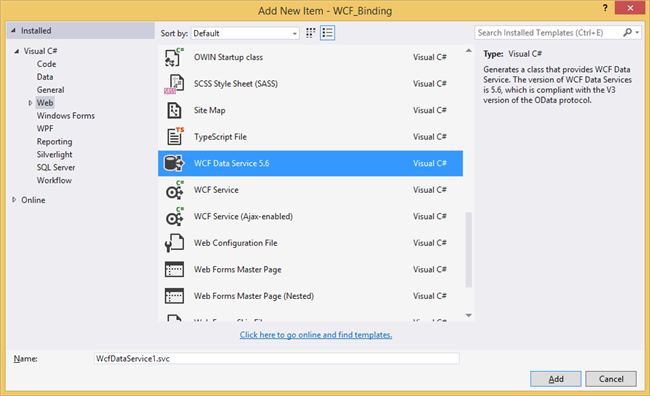 In Add New Item Wizard, Select WCF Data Service 5.6 under Web Template. In Name text box enter WcfDataService1.svc and then click Add button. Once service is added and configure the read and write access to resources in InitializeService function of DataService. // TODO: set rules to indicate which entity sets and service operations are visible, Updatable , etc. 5.On the menu bar, select Debug->Start without Debugging to execute the service. A browser window opens and the XML schema for the service is displayed. You can also get the localhost address for the service here. To create the WPF client application, add new WPF project in the same solution and name the project as NorthwindEditor. After creating the WPF application, you can add the service created in previous step to your WPF project. Right-click on your WPF project and select Add Service Reference option to add the service created in previous step. Add Service Reference wizard appears, then select Discover button which displays the list of available services in Services panel. 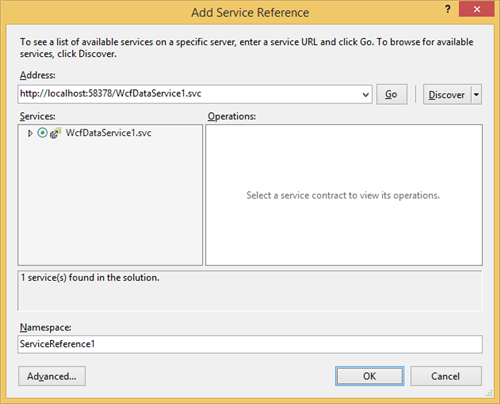 Select WcfDataService1.svc and click OK option to add the service reference to your WPF project. Add SfDataGrid control and the required assemblies in your WPF application. Wire the SfDataGrid.Loaded event and set the northwindEntities.Order_Details table to SfDataGrid.ItemsSource. Replace local host address as URI of your service. You can get the local host address from the shortcut menu of the “WcfDataService1.svc” file in Solution Explorer and select View in Browser. Internet Explorer opens and the XML schema for the service is displayed. Copy the localhost address and replace it in your service URI. Set the WPF application as StartUp project. Now, run the application and you can see the SfDataGrid control loaded with data from WCF service. SfDataGrid control supports to bind data from ADO.NET Entity Framework. In this walk-through, you will learn about binding data from ADO.NET Entity Framework and save back the changes to the database. You can download the entire source code of this demo from here. 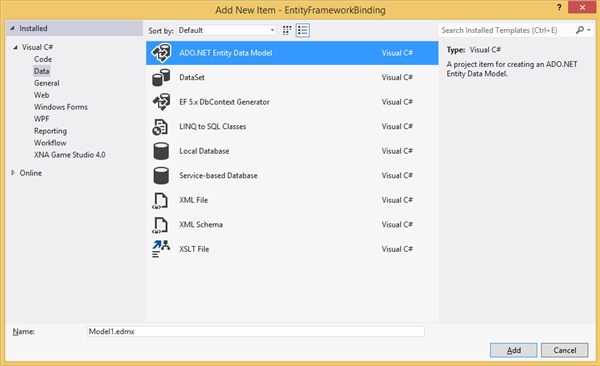 Loading data from Entity Framework. To load data from Entity Framework, create a new WPF Application and add the SfDataGrid control to your application. Right-click your WPF project, select Add option and then click New Item. 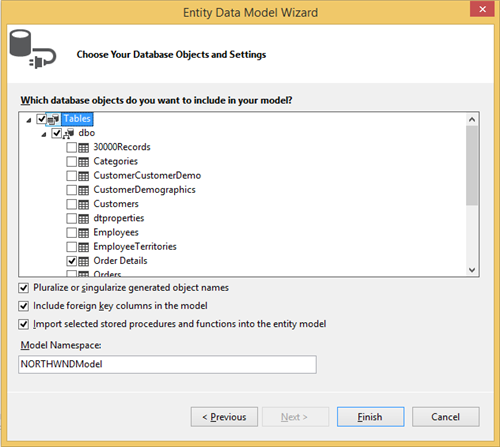 The Add New Item wizard appears, select “ADO.NET Entity Data Model “ from the Data node. Name the file as Model1.edmx and then select Add button. In the Choose Model Contents, select Generate from database option and then click Next. In the Choose Your Data Connection, select Northwind database from the drop-down list for data connection. 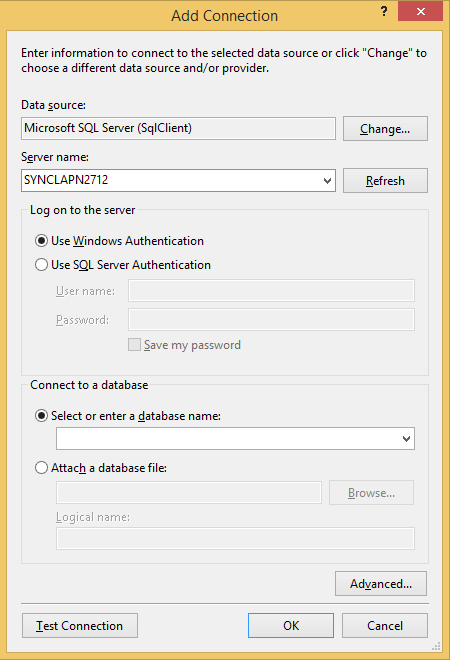 To configure/modify connection, you can refer: How to: Create Connections to SQL Server Databases. Enable the Save entity connection settings in App.config as check box and then click Next. In the Choose Your Database Objects and Settings, expand the Tables node and select the Order_Details table. Click Finish button to add the EntityBindingFramework.edmx file to your application. The Entity diagram for the Order_detail table is opened. 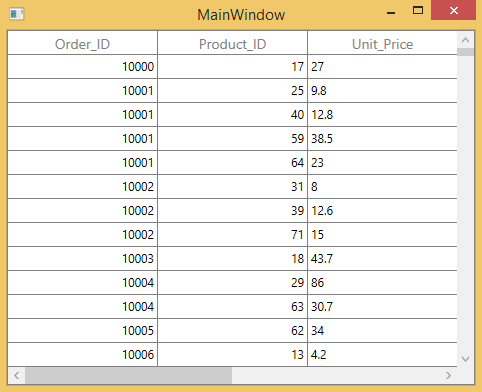 To access data from the database created in previous step, create a ViewModel class with OrderDetails property and the OrderDetails is initialized by accessing the Order_Details table from the database. 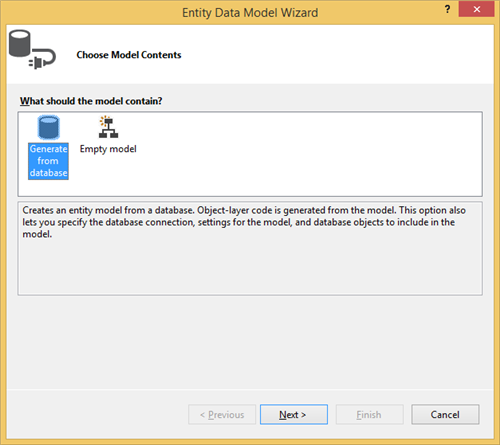 To populate the SfDataGrid using Entity Framework, bind the collection created in previous step to SfDataGrid.ItemsSource property and set the DataContext as ViewModel. Now, run the application and you can see the following screenshot shows the SfDataGrid control populated with data from Entity Framework data service. You can save the row or cell level changes back to the data source by handling SfDataGrid.RowValidated, SfDataGrid.CurrentCellValidated or SfDataGrid.CurrentCellValueChanged events. The below code example will save back the changed value of row to data base. SfDataGrid control supports to bind data from LINQ to SQL .In this walkthrough, you will learn about binding data from LINQ to SQL and save back the changes to the Database. To add LINQ to SQL, create a new WPF application and add the SfDataGrid control in your application. To create data model using LINQ to SQL in WPF project follow the below steps. Right-click on your WPF project, select Add option and then click New Item. 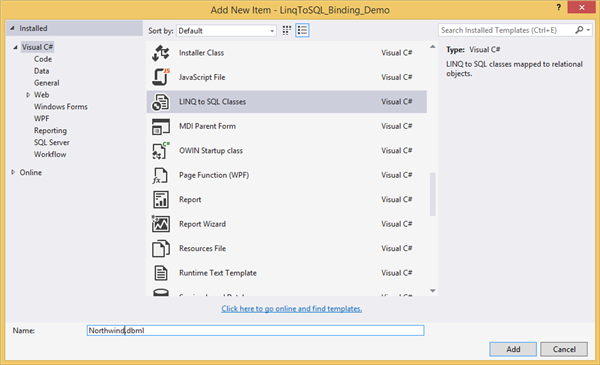 The Add New Item wizard appears, select LINQ to SQL Classes from the Visual C#. Name the file as Northwind and then select Add option to add the Northwind.dbml in your project. Once the Northwind.dbml is added in your project, then the design view is opened. You can add new Database connection by clicking add icon button in Server Explorer. The Add Connection wizard appeared with the default data source as Microsoft SQL Server Database File (SqlClient). Click Change to open the Change Data Source dialog box and select the type of data source that you have owned. In the Server name option, click the Refresh button to select the server from the drop down list. Enable select or enter a database name radio button to select database from the drop down list under the Connect to a database option. Click Test Connection to check whether the connection with your database is succeeded or not. Once the connection is succeeded, click OK button to add database in your server explorer. Drag Shippers table in to design view of Northwind.dbml. The Entity model diagram for Shippers table is generated once it is dropped in to design view. 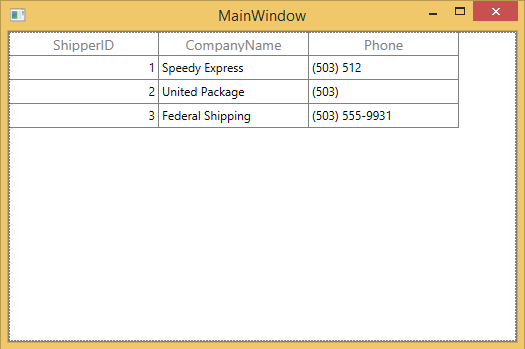 To load the database created in previous step in to SfDataGrid, create a ViewModel class with Shippers property and it is initialized with Shippers table in Northwind database. 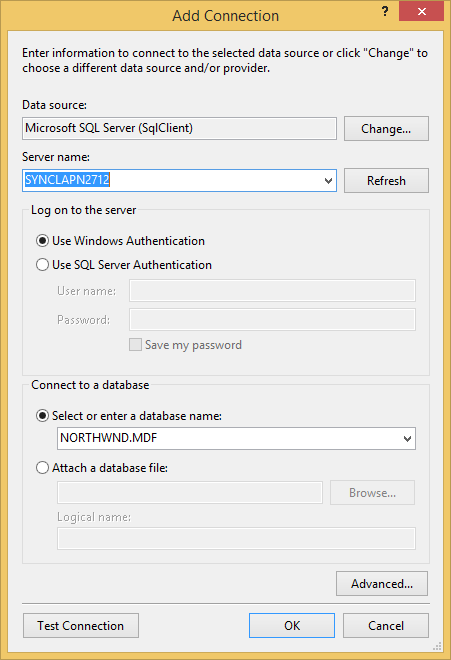 NorthwindDataContext is from Northwind.Designer.cs file (it is from the file that is added with LINQ to SQL). Shippers are selected table from Database. 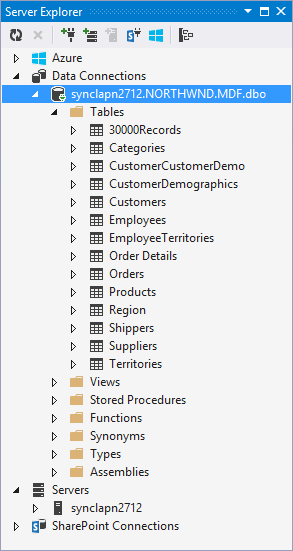 To bind data from LINQ to SQL classes, assign the Shippers collection created in the previous step, to SfDataGrid.ItemsSource property and set the DataContext as ViewModel. Now, run the application and you can see the following screenshot shows the SfDataGrid control loaded with Shippers data. The below code example will save back the changed value of row to database. SfDataGrid control supports to load the data using ADO.NET. In this walk-through, you will learn about binding data from ADO.NET service and save back the changes to the database. 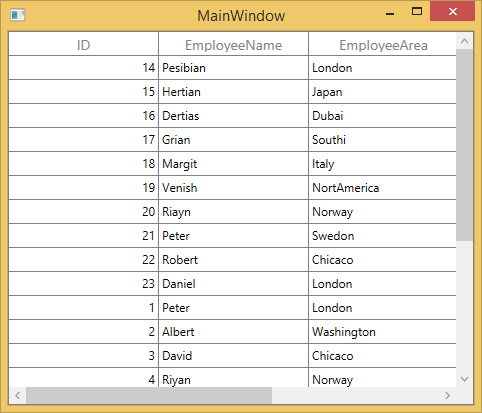 To display the data from the ADO.NET data service, create a new WPF Application. In the Tools menu, select the Connect to Database. Enable select or enter a database name radio button to select your database from the drop down list under the Connect to a database option. Click Test Connection to check whether the database connection is succeeded or not. To get connection string for the database, right-click on your database and then click properties option. To access the data from data source using ADO.NET, follow the below steps. Create a user interface with SfDataGrid control and add the required assemblies to your WPF application. Create a connection through any of the .NET Framework data provider based on the type of data source that you have owned. Set the ItemsSource as Shippers table from data set. For more information refer here. Now, run the application and you can see the following screenshot displays the SfDataGrid loaded the data using ADO.NET. You can refer the below MSDN link for more information. SfDataGrid control supports to bind data from Microsoft Access database .In this section, you will learn about how to bind the data from Microsoft Access database to SfDataGrid. Create a new WPF project. Import the Microsoft Access database file to WPF project. You can connect the Microsoft Access Database through the OleDbConnection. Create and open the connection. Use OleDbDataAdapter to load the data in to DataSet. Access the Employee table from the DataSet and set the Employee collection as ItemsSource of SfDataGrid. 7.Now, run the application and you can see following screenshot shows the SfDataGrid control populated data from Microsoft Access database. By default, the scrollbar position is not maintained and gets reset when changing the ItemsSource of the SfDataGrid. But, you can maintain the scrollbar position of the SfDataGrid by setting the SfDataGrid.CanMaintainScrollPosition value to true.